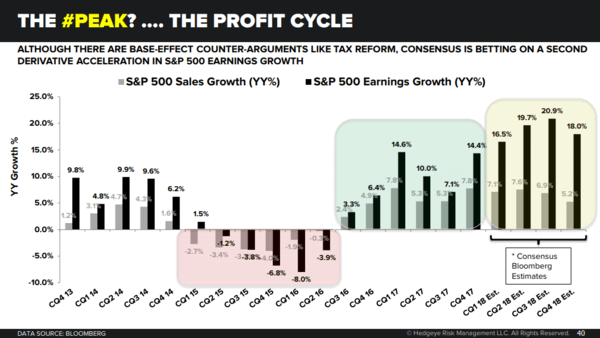 Hedgeye - Earnings Estimates Sky High: What's Wall Street Smoking? Wall Street has really outdone itself this time. Earnings expectations for the first quarter of 2018 are currently sitting at levels not seen in 7 years. It's sad but true: Market strategists tend to make forecasts by taking recent memory, applying some added growth rate then extrapolating that into the future. So here's the latest, if Wall Street's estimate of 16.5% ends up being the final growth rate for the first quarter, it would be the highest earnings growth for the S&P 500 since Q1 2011 (19.5%). Furthermore, the "comp," against which 1Q 2018 earnings must exceed to realize any growth, was up +14.1% in 1Q 2017. That's a high bar for the first quarter to beat. And the tough comps continue throughout the year. To be sure, there are some difficult-to-model events, like tax reform, which could goose the numbers. But any estimate of tax reform's impact on corporate profits is purely qualitative. Therefore Wall Street's swollen estimates have dubious value at best. After questioning the U.S. growth acceleration for the past 6 quarters, from the 2Q 2016 lows in year-over-year GDP (1.3%) to 4Q 2017's 2.6%, we think Wall Street is now missing peaking U.S. GDP growth. 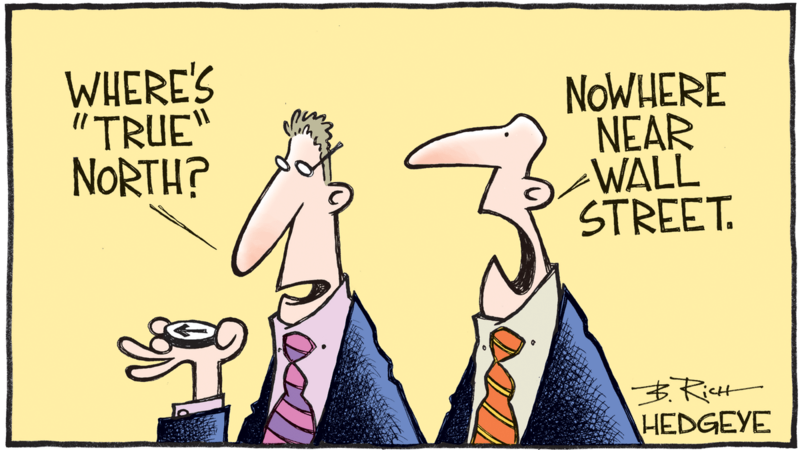 "Industry analysts in aggregate predict the S&P 500 will see a 16.2% increase in price over the next twelve months. This percentage is based on the difference between the bottom-up target price and the closing price for the index as of yesterday (April 5). The bottom-up target price is calculated by aggregating the median target price estimates (based on company-level estimates submitted by industry analysts) for all the companies in the index. On April 5, the bottom-up target price for the S&P 500 was 3094.05, which was 16.2% above the closing price of 2662.84." You read that right... +16.2%! For real insight and analysis check out any of our investing products. We're running a 25% off Super Sale to commemorate our 10-year anniversary in the independent financial research business.